When you sign up to volunteer a day of service with a participating organization(and your service is completed and verified) you'll get one day admission to a Walt Disney World® or Disneyland® theme park, FREE! We want to inspire one million people to volunteer a day of service. Sign up now to receive reminders and exciting updates about the "Give a Day. Get a Disney day." program by clicking on "Get Email Updates" . I have avoided burning candles in my home for years due to 5 kids who just might cause a burning house down experience. Thanks to Candle Warmers I have now discovered the use of candles in my home without burning the house down. Not only are these Candle warmers an incredible invention for me , I also love their Jamie Claire candles especially the citrus splash scent. The Contempo Candle Warmer Lamp™ is the newest addition to their revolutionary candle warming lamps. With an updated modern look the Contempo Lamp creates the ambiance of a burning candle, warming and releasing the candle’s fragrance from the top down within minutes. All Contempo lamps are paired with a frosted white shade. Candle warmers have a variety of other great styles, lanterns, crock pots, lamps with a large assortment of shades …along with their amazing Jamie Claire highly fragrant scented candles which are hand poured using the finest lead-free wicks, waxes and fragrance oils. Long-burning for exceptional value, Jamie Clair candles are filled with their famous, true-to-life scents leaving a lasting scent of your favorite fragrance for days. We first featured Candle Warmers and Jamie Claire candles on 24/7 MOMS Live web show. WIN: 24/7 MOMS and Candle Warmer are giving away one Contempo Candle Warmer Lamp Combo. 2. If you are already a subscriber just leave a comment that you are a subscriber.US entries only and one entry per person. Winner will be chosen on October 11th 2009. An Operating System Isn’t Just for the Office – Organize your clothes by color or by casual to formal and then hang like-types of clothing together (i.e. shirts, pants, skirts, etc.). Make the Shoe Fit – Squeeze in more shoes per shelf by arranging pairs with one toe facing out, one toe facing in. If you like to keep your shoes in boxes, make sure you the label the original box or use clear storage containers. When Seasons Change, it’s Time to Rearrange – Rotate your fall & winter clothes with your spring & summer clothes. Store the out-of-season clothes in covered clothing racks in the attic or basement or flat storage boxes under your bed. If You Don’t Use It, Lose It – If you’re hanging onto that pair of jeans that will fit only if you lose 10 pounds, donate them. Once you shed the weight, you can buy a new, trendy pair. Get rid of stretched out bathing suits, worn out shoes, and that pair of pants you’ve been planning to alter for months now. Cutting the clutter will automatically make you more organized and efficient. It’s Not Your Closet, It’s You – Get into a routine of straightening up your closet the same time each day. Whether its before work, after work, or before you go to bed, don’t wait to put your shoes away or hang your clothes until you can’t see your closet (or bedroom) floor. Since 1982, Closets by Design has built a reputation as the nation’s leader in the closet organizing and storage remodeling industry. The company offers customers comprehensive solutions to all their organizational needs in a short and simple process by designing, building and installing custom home offices, closets, garage cabinets, wall units, laundries, pantries, wardrobe mirror doors and other home organization systems. Closets by Design offers a wide selection of finishes, accessories and hardware. There are currently 33 franchise locations serving major markets across the country. To schedule a FREE in-home consultation or inquire about franchise opportunities, please visit www.closetsbydesign.com or call 800-293-3744. Reading is fun when the Story is about YOU! is the slogan of Book-Worm-Store.Com. Every child loves to be read to especially when the story is about them, where they live, who their friends are and even about what they like to do. That is what Book-Worm-Store.Com creates personalized books. Each of their personalized stories teaches principles and values to your children as the read about them selves. Book-Worm-Store books make great gifts, they create personalized books for Girls, Boys, Babies, Grown-ups, birthdays, and even have religious and holiday ones. Basically there is one for everyone. WIN: 24/7 MOMS and Book Work Store are giving away ONE personalized book. To enter for your chance to win: 1. Become a 24/7 MOMS Subscriber Enter your email address below then leave a comment that you subscribed. 2. If you are already a subscriber just leave a comment that you are a subscriber.US entries only and one entry per person. Winner will be chosen on October 11th 2009. Q: If you could enter the pages of any of your story books, which would you enter? Q: What starts with an "E", ends with an "E", and only has one letter in it? Doctor Appointments, Dance Practice, Soccer Practice, Dentist Appointment, Teacher Conference, Orthodontist Appointment, Birthday's, and the list goes on of the many activities and events we as moms have to keep track of. The momAgenda desktop has become one of the hottest organizational must haves among moms. WHY? Because momAgenda desktop is for today’s mom – the mom who lives in a multi tasking world, the mom who has more to do than she can remember, the mom who wants to be organized simply, the mom who likes trendy styles and colors. The momAgenda desktop has been designed for YOU. The momAgenda desktop comes in the latest colors: Lime, Royal Blue, True Purple Chocolate, Tangerine and Fuchsia. Inside the momAgenda you will discover unique week-at-a-views with space for Mom and up to four kiddos. It also features monthly calendars, a place to organize parties, vacations, gifts and so much MORE. Join the momAgenda craze and get organized simply! Stop by www.momagenda.com and see all their great MOM organization products. So how do you get YOUR very own momAgenda? 1. check out the momAgenda web site and purchase yours TODAY. 2. WIN : 24/7 MOMS and momAgenda are giving away one desktop planner. Here at 24/7 MOMS we have found a wonderful custom jewelry designer that is great for fall fashion or any time of the year! Custom-made by Central Florida artist Elena, these pendants are the perfect way to show off your favorite photo. These marble pendants are Elena's original design and are made using a process that she has spent the past five years developing. Each piece is sealed to prevent peeling. (water resistant but not water proof). Available in square (approx 1"x1"), small round (approx .75" diameter) and large round (approx 1.5" diameter). Pendant comes on your choice of silver chain, satin cord or hand-beaded wire. Slight imperfections in the glass of the marble can occur adding character to the piece and making each one truly a one-of-a-kind item! Please allow 3 weeks for delivery. 2. If you are already a subscriber just leave a comment that you are a subscriber.US entries only and one entry per person. Winner will be chosen on October 18th 2009. Deal of the Day: Get a free Memories Stitched With Love calendar filled with creative activities and inspirational content from Annie’s and KIWI magazine when you buy any Annie’s Homegrown product. Click here to get your FREE calendar! Q: If you could turn into any animal, what animal would you like to be? Q: What bet can never be won? MOM TIP: One of my Favorite cleaning tools as a MOM is the new re-designed Swiffer Wet Jet. The Mommy clean-up of the many OOPS spills and messes that found their way to my floors became simplified with the invention of Swiffer Wet Jet . I can MOP my tile, laminate and hardwood floors all with the use of my Swiffer Wet Jet. My teenage daughters have also come to love this cleaning tool when it is their turn to mop the kitchen, bathrooms or entry floors they can quickly accomplish their chores with the use of the Swiffer Wet Jet. The redesigned Swiffer WetJet is an all-in-one power mop that easily cleans tough dirt and dried-on stains better than a mop and also has an Antibacterial cleaner that kills 99.9% of bacteria on floors - something moms will love! Sign up for the Home Made Simple Book! filled with savings on all of the Swiffer Products. Love it or your Money Back! Click here for details . Ready to WIN a Swiffer Wet Jet? WIN: 24/7 MOMS and Swiffer are giving away one redesigned Swiffer wet jet. "ABC's of Reading To and With Your Child"
Buy books as gifts for birthdays, Christmas, Hanukkah, or other holidays. Chat about what is happening in the book and how it relates to everyday life. Drop everything and read. Set aside 20 minutes a day during which the whole family reads. Give hints when your child gets stuck on a word. Have fun. Smile and enjoy the story. Read with a slow, relaxed voice and be expressive. Invite your child to the bookstore. Take time to lounge in the chairs and browse the books. Join in your child's reading successes. Celebrate every small step with sincere praise. Kids love to receive mail. Send your child a magazine subscription in an area that interests him or her. Learn to read with, and not just to, your child daily. Read aloud, share ideas, and answer questions. Model reading. Share with your child, whether you're reading for information or for entertainment. Never force your child to read. If you're both too tired or discouraged to read, take a break. Offer your child a variety of reading materials, such as books, magazines, cereal boxes, comics, and newspapers. Predict story elements, draw conclusions, and retell the story with your child. Quiz your child at the end of a story. Informally, of course! Reread books to familiarize your child with words and to build self-confidence. Sing songs, recite poetry, and do finger-plays to help develop language and listening skills. Try to help your child understand that it's okay to make mistakes. Understand that reading is developmental and that it takes time and practice to become fluent. Visit your local library on a regular basis. Sign your child up for his or her own library card. Welcome wordless picture books into your collections. They generate conversation and allow the nonreader to create his or her own stories. "Xhibit" patience when your child is selecting books. Your support is empowering. You are the most important person in helping your child develop a lifelong love of reading. Zealous readers are the result of supportive and nurturing role models. Stop by the Alpha-kidZ fun interactive web site . WIN: 24/7 MOMS and Alpha-kidZ Publishing Company are giving away one set of their current collection of the first 16 letters of the alphabet A to P.
Put your kids t o bed - Put on your P.J. 's - Surf over to www.247moms.com and join us. It's where REAL MOMS are chatting it up every Tuesday night. - 24 minutes AFTER the show chat-tin it up with us LIVE. Tweet, TXT, Facebook , invite all of your MOM friends to this weeks 24/7 MOMS Live web cast. ( TV Show on your computer). 5 weeks into the new school year and I'm already searching the grocery store shelves for healthy, yummy and simple foods to place in my kids lunches. Maybe it is that I want to be proactive before the I don't want ANOTHER Peanut butter and jelly sandwich conversation begins or maybe it is that I am already tired of packing the same things day after day. Which ever it is I was excited when in my mail box arrived a few new ideas for my kiddos lunches. I was sent a few lunch box idea samples recently from Safeway and Warner Bros.’ Looney Tunes who have teamed up to create Eating Right Kids™ to bring you meals, snacks, cereals and drinks your kids will love—and you’ll feel good about. Eating Right Kids is a full line of foods that are not only tasty, but better for children: It has been formulated to standards based on the most recent dietary recommendations and regulations from several federal and state agents. My kids are great fruit eaters but like a variety so these new Eating Right Fruit Cups will be a big hit with them. These convenient, single-serve containers go anywhere kids do! Plus they are filled with lots of flavor for happy tummies. Delicious fruit in naturally flavored extra-light syrup, with 100% of the daily value of vitamin C, 15% of the daily value of vitamin A, and 10% of the daily value of calcium per serving. Choose from Mixed Fruit, Diced Pears, Diced Peaches – or stock up on all three fruits! Q: If you could be any age right now, what age would you be? Q: What has a hundred limbs, but cannot walk? Each morning I turn on my computer, click get mail and it arrives. My daily inspiration/devotion from Proverbs 31 Ministry. If you are like me and need a bit of inspiration to get you through your hectic day? Proverbs 31 daily devotions offer today's busy women/moms encouragement as they seek to draw closer to the heart of God. Through "Encouragement for Today," you will be inspired as you read these encouraging daily devotions. Click here to Sign up for your daily Proverbs 31 devotions to be set directly to your in-box. Here is an example of what will arrive daily to your in-box. In today's economy, I look for every way to save money. I'm a sale-shopping, coupon-clipping, leftover-loving woman. I'm a firm believer in Benjamin Franklin's well-known adage, "A penny saved is a penny earned." And this past couple of years, my family has certainly had to apply that to our lives in greater measure. Sometimes, however, saving money just isn't enough. As many families face a reduced income due to layoffs and company closures, there are only so many ways to cut corners. So I'm also a believer in trying to make money in creative ways. As many of us wonder what the future holds financially, I'd like to suggest we look at a biblical example of how to use the resources we have within our homes to increase our families' incomes. One of the best examples I know is found in Proverbs 31. Throughout chapter 31 we meet a woman who was a good manager of all her resources, and in verse 24, we learn that she used her weaving skills to make money. As I consider this women's ingenuity, I learn that she identified a need (merchants needed sashes) and then used her skills (making garments) and energy (selling them) to increase her family's financial well being. I wonder if many of us overlook this principle as we face a financially shaky future with dread. Perhaps we don't need to look for an employer that is hiring, but instead should consider how to use the resources God has already given us. On a recent trip, I met a wonderful example of a woman doing just that. She is past retirement age, lives alone and wanted to bring in extra income. Since I'm a small business owner, our commonalities got us talking. This productive woman buys used wool sweaters, shrinks them and sews them into designer mittens using other fabrics and decorative accents. Then she sells them in a local shop where she has a booth. That's not all she sells. She has added hand-made products made by women working at home in other countries, plus some unique new clothing items she buys and resells. It all started with a creative idea, the use of her talents and some energy to sell them. Artistic talents aren't the only resource we have to help our families. Many people have other skills that can be used to increase incomes. Some examples are physical strength, athletic training, organization, planning, love of travel, cooking, gardening and cleaning. Many have families that can help. This past summer I watched a local landscaper work every week with his two sons by his side. They are a family pulling together when it counts most. No one wishes for hard financial times – though we can learn much in them. When God is on our side, there are always opportunities waiting to be uncovered. Instead of dreading the future, perhaps God wants to tap into the unique resources He has planted within our lives and family for such a time as this. Dear Lord, I thank You today for the many resources You have given me. Thank You for my life, for my mind, for what health I have and for the hope you offer. Please help me to see how I might use these resources to become more financially productive. Only You know the true depth of my needs. So today I ask for Your help. I know I can do all things through You. In Jesus' Name, Amen. Visit Glynnis' blog to read suggestions for home-based businesses you can start with little money. If you are in a place of financial need, take some time to evaluate all the resources you have. List five that could possibly be used to increase your financial health. Reflections: God often uses our finances to teach us lessons. What have you learned about God as a result of a financially difficult time in your life? What is one wise money management principle that you should apply to your life now? © 2009 by Glynnis Whitwer. All rights reserved. Got Tweens? kids ages 9 to 12 who are full of adventure? Who you are always looking for new books to inspire them to read ? Then check out the latest Bill Meyers series The Elijah Project. The Elijah Project series of books include On the Run, The Enemy Closes In, Trapped by Shadows, and The Chamber of Lies. They have been written for readers ages 9-12, The Elijah Project series explores the adventures of Zach and his sister Piper as they battle to protect their little brother Elijah, a six-year-old whose supernatural gifts have drawn the attention of dark forces. The first book in the series, On the Run, introduces 16-year-old Zach and his 13-year-old sister Piper. The brother and sister team must search for their parents while trying to keep Elijah safe. Although he never speaks, there is something pure and supernatural about Elijah that the powers of heaven want to protect and the powers of darkness want to destroy. Zach and Piper are going to need a lot of help from heaven to protect their little brother. The Elijah Project series is the latest in a growing list of Zonderkidz titles targeting 9-12 year-old readers. WIN- 24/7 MOMS and ZonderKidz are giving away one copy of On The Run book. A national movement championed by the Center on Addiction and Substance Abuse at Columbia University (CASA). Their goal is to encourage families to make a tradition of eating together, which statistics have shown reduces the likelihood their children will become involved with drugs. R- Recognize that I have the power to help keep my kids substance free! CASA’s website also offers talking points, tools and best of all, a free Family Dinner Kit. Download free placemat designs, word games, conversation starters, recipes and more! The J.M. Smucker Company sponsors a wonderful website full of ideas for making your family meals great. It’s not just about recipes; it’s timely inspiration and tools as well. A free monthly email offers you new ideas and input from families just like yours. Check out the “Why Mealtime Matters” page and you’ll find answers to some of your mealtime challenges (scheduling, communication, and distractions). Miriam Weinstein Author of The Surprising Power of Family Meals writes “Miriam’s Blog” where she discusses new meal ideas. “Miriam’s Articles”, an online archive, highlight special times of the year. Special sections devoted to holidays and special occasions, will give you new ideas for family traditions. “Meals and Menus” helps you create a meal-ready pantry, a meal plan, and tons of recipes. Tomorrow is National Family day - A Day to Eat Dinner With Your Children. Let's take it one step further and play a family game after dinner with our children and create some Family Fun. A new game in the Novotny home that we received to try out is Backseat Drawing Junior from Out Of The Box. The fun begins watching your little artist attempt to draw the unknown, then laughter sets in as everyone attempts to figure out what they actually drew. A game of fun, creativity and full of family laughter. WIN: 24/7 MOMS and Out Of The Box are giving away one Backseat Drawing Junior game. I admit it, I admit it I'm hooked on the newest snack to hit the grocery store shelves -Nature Valley Granola Nut Clusters . I have even placed a few bags in our on the go snack bag for the fall soccer games. Thanks to Blog Spark who kindly introduced me to these yummy snacks. Yes, in my opinion Nature Valley has re-shaped snack time with a delicious new treat. Nature Valley Granola Nut Clusters are a bite size blend of 100% natural ingredients that include select roasted nuts, whole grain oats and a touch of honey - a wholesome and delicious pick-me-up any time of the day. If you love nuts, you´ll enjoy this flavorful little snack featuring the perfect combination of sweet & salty flavors paired with a crunchy texture that you can see and taste. And with the first unique cluster-shaped granola packaged in a handy re-sealable pouch, it´s perfect for sharing on the trails or in your living room! New Nature Valley Granola Nut Clusters come in four easy-to-crave flavors: Nut Lovers, Roasted Almond, Roasted Cashew and Honey Roasted Peanut. Which is my favorite ALL of them. 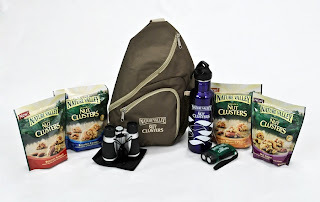 WIN: 24/7 MOMS and Nature Valley are giving away one snack prize pack that includes all four (4) varieties of the Granola Nut Clusters along with a sling backpack, stainless steel water bottle, flashlight and binoculars! Shout us out and you will be entered for a chance to WIN this weeks MOMtourage giveaway. You can earn up to 4 entries each week by doing any of the below options, just be sure to come back and fill out the form after each entry! - Post about 24/7 MOMS Live web cast on your Facebook, with a link to www.247moms.com. - Add the 24/7 MOMS Live web cast button to your blog . Copy and paste link below. ( receive a weekly entry every week you keep our button on your site). MOMS, if you would like to add our button to your blog, please use the code below. Once you have completed an entry method, fill out the form below! Be sure you fill out a form for each entry you do. Q: If you could live any where, where would it be? Q: What can you serve, but never eat? Lacy Leggings for you Baby! Baby Bella Maya Lacy Leggings are a hot new trend! Go cute and sassy with the lacy leggings paired with your baby's favorite dresses and skirts. Cover diapers in a fun and fashionable way. These amazing Baby Lacy Leggings are a sure way to turn heads everywhere making your baby the center of attention. And for added flair you can add bling to your lacy leggings. Your little diva will rock her way into the center of attention. Available in size 6-12 months and 12-18 months only. These are SUPER cute! And great for church! Deal of the Day - Quizno's B1G1 free sub. 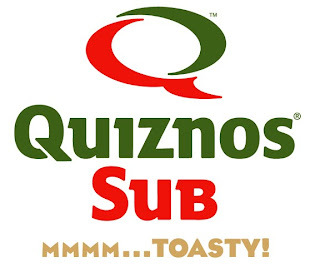 Print your coupon by clicking here for your FREEbie Quiznos sub. Touch and Feel stroller cards make wonderful shower gifts. We all know how our little ones love to grab and touch everything when we are out and about and with the great ability to attach this fun set of stroller cards to what ever you are carrying them in, makes for the perfect on the go activity. Julius! Touch-and-Feel Stroller Cards -- Stroller time is much more fun when these flash cards come along for the ride! Each set features 5 double-sided cards with engaging textures and pictures. Easy to attach to a stroller, backpack, or diaper bag, these cards won't get lost, and the interactive touch-and-feel feature makes them great independent entertainment for toddlers on the go. WIN: 24/7 MOMS and Chronicle Books are giving away 1 set of Julius Touch-and Feel Stroller Cards. MOM TIP : We moms wash, Dry and fold the laundry only then to have to put it all away. With 5 kids that mean a lot of trips from the laundry room to the kids bedrooms until I decided it was time to add this to their daily To Do (chore) list. First problem was I did not have room for 5 more laundry baskets in my laundry room so how would I divide up the laundry into their own organize piles that they could easily take to their rooms for the new chore of putting away their own clothes. My solution was to purchase 5 dish tubs they fit perfectly on my counter and could only hold a few days worth of clothes which meant they would need to be sure to empty these out often. These are small enough that even little ones could handle carrying them to their bedrooms and are stackable when not in use. 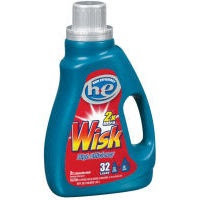 Over the last several weeks I have been using a bottle of WISK he to wash my piles and piles of laundry in my new Frigidaire he front loader. The results have been clean, fresh smelling kids clothes. So if you Got Laundry Get WISK is my advice. WIN: 24/7 MOMS and WISK are giving away a bottle of WISK he to one our our 24/7 MOMS. Mt. Wash Me continues to grow daily in my laundry room, as if it is a volcano waiting to erupt unless I stay on top of the Novotny laundry each day. I am always on the look out for ways to simplify my laundry (Mt. Wash me). So, how can a washing machine simplify my laundry experience. Several weeks ago a brand new classic RED Frigidaire Affinity 3.5 Cu. Ft. Front Load Washer arrived into my home to assist me in simplifying the Novotny laundry. W - Wash sense technology ensures clothes get clean with care. S - Save time with TimeWise™ Technology - wash time equals dry time - so I no longer wait for clothes to dry. H - Helps my MOMnesia ( memory loss) with the Save Your Settings feature that Automatically save your last wash setting so you can save time when doing laundry. Stop by Frigidaire.com and see the entire collection of more than 250 kitchen and laundry appliances designed to save you time. The goal is that these appliances will help give Moms more free time by working smarter. Now, I must get back to Mt. Wash Me before it erupts.